Sea and inland harbours are the nodes in land-to-ship transport with the strongest growth and due to the deep integration of the German economy into international production processes based on the division of labor they are of central macroeconomic importance. Without ports and ships world commerce would be impossible. This supplement reports on national and international port structures as well as the required terminals and transshipment quays. The introductory contributions present a general market overview that illustrates the capacity of ports and especially booming regions in port construction along with examples of port design and development. 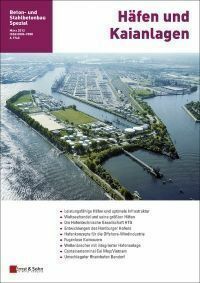 The reader may also discover what importance the German Port Technology Association as a technical association of experts in port and hydraulic engineering holds for many aspects regarding ports, shipping and logistics. The second focus of the supplement lies in the technical description and illustration of the newest construction methods using national and international examples. New concepts for ports for the off-shore wind industry are presented especially with regard to the necessary off-shore logistics. Two contributions describe the construction of joint-free quay walls and confirm that this method of designing reinforced concrete superstructures and crane beams without joints has become prevalent. Other contributions about the construction of breakwaters and container facilities as well as the expansion of a transshipment quay into an efficient inland port are all concerned with the question of foundations and illustrate impressively the complexity and interdisciplinarity of port construction as all shown projects do.